Function: The Residential Mortgage Board approves or disapproves regulations proposed by the Commissioner of Finance with respect to mortgage brokering and hear and determine any appeal from a denial or revocation of a mortgage broker license or decision of the Commissioner pertaining to mortgage brokering. Location of meetings: Jefferson City. Pursuant to Section 443.816, the Board may meet at any place in this state. 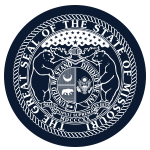 Member Requirements: One member must be an attorney and a member of the Missouri Bar in good standing. Three members must be experienced in mortgage brokering and one must have no financial interest in any mortgage brokering business.